Often mistaken for a palm, Ponytail Palm is actually a semi-succulent more closely related to the Yucca. Are you forgetful about watering? This may be the ideal house plant for you. In fact, the most common mistake with this plant is overwatering it, especially in winter. When in doubt, keep it on the dry side. 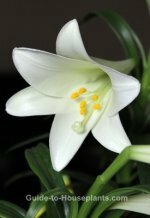 A native of the Mexican desert, this house plant tolerates the dry air of heated homes extremely well. Ponytail palm makes an easy-to-please house plant and a striking accent for a sunny room. If you find that the leaf tips are turning brown, it is caused by overwatering and underwatering. Snip off brown leaf tips with sharp scissors or pruners, but take care not to cut too much off. 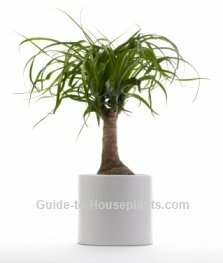 Good ponytail palm care will ensure that your house plant will live a long time. Slow-growing, it rarely needs repotted. In fact, it grows best when it's pot-bound. 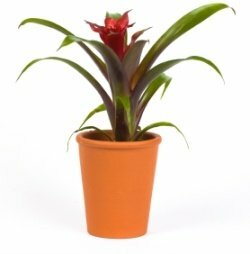 As it grows tall, it's a good idea to pot it in a heavy container to prevent toppling. 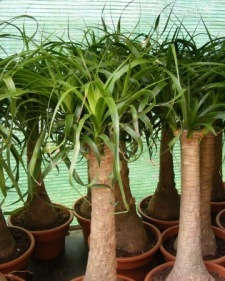 Beaucarnea recurvata is a slow-grower, so buy one the size you want. Otherwise, you'll wait for years for it to grow into a large tree. Height: Slow-growing, it can take 20 years to reach 6 ft (2 m) indoors. It is easy to grow as a bonsai, reaching only 1-2 ft (30-60 cm) tall -- it doesn't need shaped or pruned at all. Water: Allow soil to dry out a bit between waterings. In winter, water only enough to prevent the soil from drying out completely. Avoid getting the trunk wet because it is prone to rot; water the potting mix instead. Remember to always use room-temperature water when watering your plants. Humidity: Average (around 40% relative humidity); will tolerate dry air. Soil: A fast-draining medium such as cactus potting mix. Fertilizer: Feed monthly in spring and summer with a balanced liquid fertilizer diluted by half. Don't feed in winter, when growth is slower. Propagation: Can be sown from seeds. In spring, you can remove the offsets that grow from the base of the plant and pot them in their own containers.